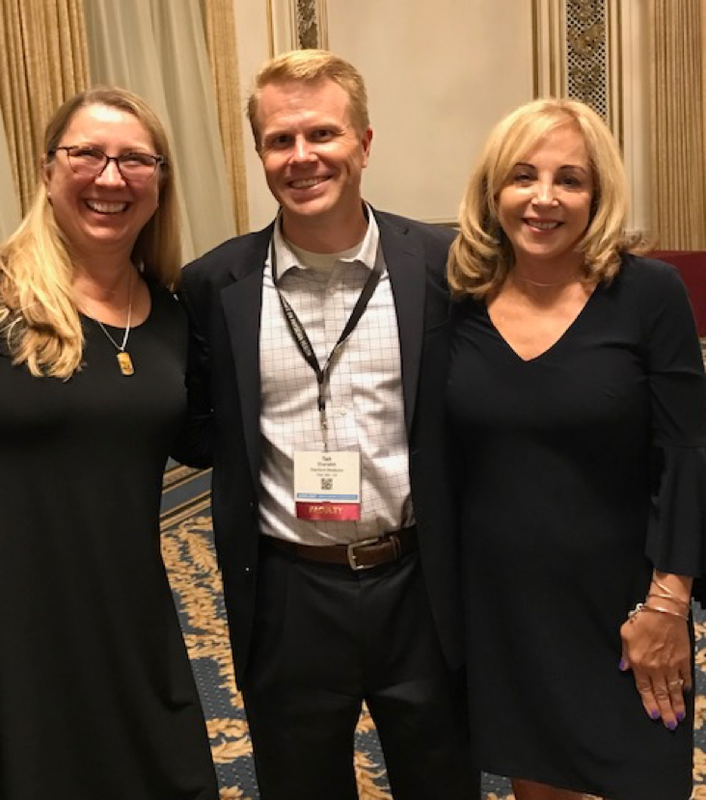 Kathi Norman, left, and Elaine O’Brien, right, with Dr. Tait D. Shanafelt, Chief Wellness Officer, Stanford Medicine, and Director, WellMD Center. Two members of IPPA’s Positive Health and Wellness Division Leadership Team, Kathi Norman and Elaine O’Brien, attended the 2017 Inaugural American Conference on Physician Health (ACPH). Their reports on the event follow. Physician burnout, depression, and suicide are unfortunately not rare in medicine. One million people lose their doctor to suicide each year in America alone. Post mortem, undiagnosed (or hidden) depression has been identified as one of the culprits. In October 2017, the American Medical Association (AMA), Stanford, and Mayo joined strength for the first time ever to bring the epidemic of physician burnout, suicide, and depression to light. The conference sold out within days. Dr. Tait Shanafelt knows about burnout or a state of chronic stress that leads to physical and emotional exhaustion, cynicism and detachment, and feelings of ineffectiveness and lack of accomplishment. Shanafelt’s research reaches back to the early 2000s. Dr. Shanafelt led the charge on physician wellness at Mayo and most recently was recruited by Stanford as the first Chief Wellness Officer. His plenary speech, “Creating a Culture of Wellness: Organizational Approaches to Promoting Physician Well-being,” identified four key areas that need to be addressed: professional fulfillment, personal resilience, efficiency of practice, and a culture of wellness. The audience had the distinct honor and pleasure to hear the 19th Surgeon General, Dr. Vivek H. Murthy discuss how his internal medicine residency at Brigham and Women’s Medical Center now holds “being nice” as the number one reason to get in to the residency program. The science of positive psychology is familiar with many of the concepts that were disseminated over the weekend and felt to be essential in moving forward in physician well-being such as personal resilience, self-compassion, engagement, and relationships. We are a long way from resolving the epidemic of physician suicide, burnout and depression, but this conference was essential in getting the conversation started in such an open venue. The inaugural American Conference on Physician Health was a revelation sparking passion, hearts, minds, and hope. Nearly every conference attendee had sadly experienced a loss personally, or knew someone who had been tragically touched by physician disengagement, depression, burnout and/or suicide. The conference aims were to lift up doctors’ well-being, cultivate strategies and best practices, and inspire people, organizations, and systems to identify ways to put the joy back in medicine. A Culture of Wellness: positive work environments, values promoting self-care, personal, professional growth. Compassion for all. Efficacy of Practice: uplifting best practices, positive relationships, and safety. Personal Resilience: promote skills, behaviors, and attitudes contributing to personal, professional, and organizational well-being. Topics from applied positive psychology research, theory, and practices — including movement, mindfulness, mindsets, gratitude, contemplative practices, energy management, and stress reduction — were championed as strategies for promoting positive change in medicine. Really great to see that more attention is being paid to the emotional well-being of physicians. 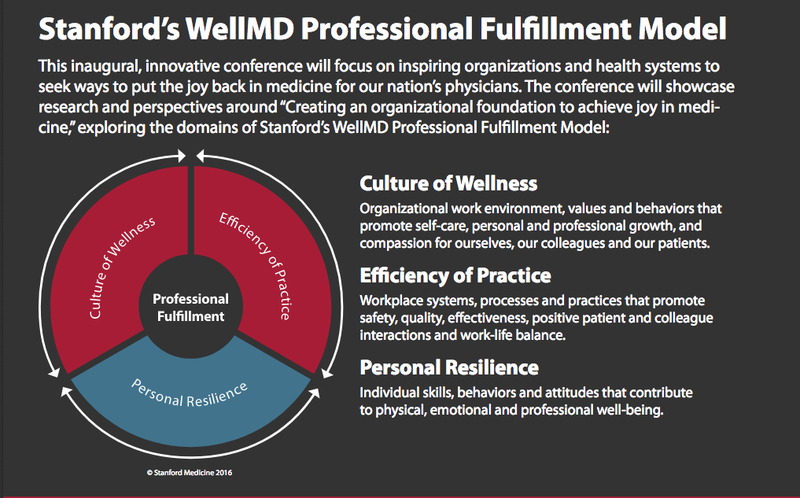 The Stanford WellMD Model looks like a useful framework that would encourage all to pay attention to these vital issues.